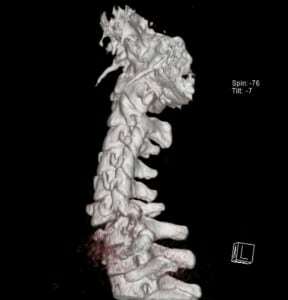 An intoxicated 29-year-old male presented to the emergency department after diving into a pool with reported loss of consciousness and complaining of neck pain. On arrival the Glasgow Coma Scale was 15 and vital signs were unremarkable. Physical exam was significant for focal C6 tenderness without step-off deformity, decreased grip strength, biceps hyperreflexia and absent triceps reflexes bilaterally. Lower extremities demonstrated flaccid paralysis, loss of sensation from the T4 dermatome down, urinary retention and no rectal tone. 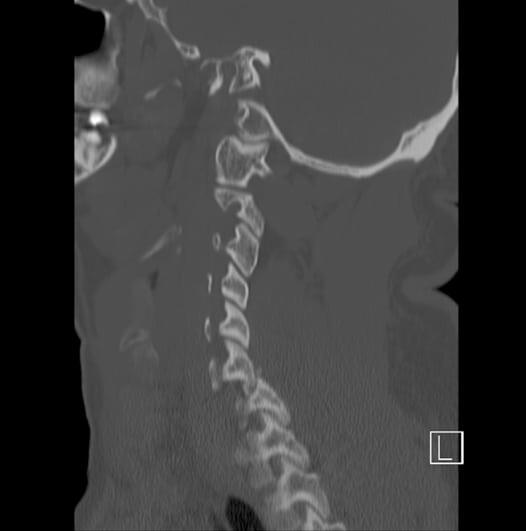 Cervical spine computed tomography (CT) demonstrated bilateral fractured and dislocated facets C6 on C7. 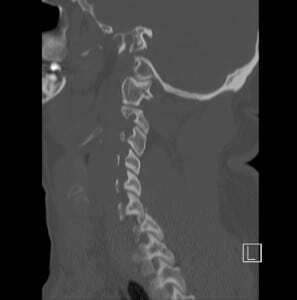 The patient was treated with intravenous methylprednisolone and admitted to the Neurosurgical Intensive Care Unit, after undergoing C6–C7 anterior disk excision with subsequent posterior fusion. At discharge he had a C7 functional level with mixed motor deficits inferiorly. Figure 1. 3D Maximal Intensity Projection (MIP) CT Image of the bilateral dislocated facets (locked facets), C-6 on C-7. Figure 2. Computer tomography of the bilateral dislocated facets (locked facets). A sagittal reconstruction of the cervical spine demonstrating C-6 dislocated over C-7. Thank you to Jaspret Brar, MD for aiding with the identification and selection of images. Submission history: Submitted August 20, 2008; Revision Received September 09, 2008; Accepted September 12, 2008. 2. Daffner, Daffner CT diagnosis of facet dislocations: The “Hamburger Bun” and “Reverse Hamburger Bun” signs. JEM. 2002;23:387–394. Severe Hyperkalemia: Can the Electrocardiogram Risk Stratify for Short-term Adverse Events?